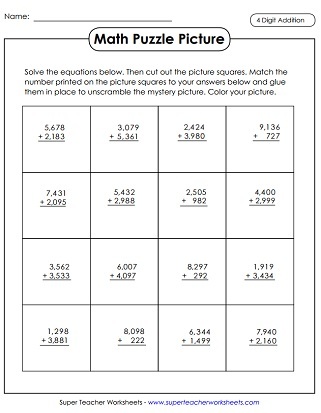 Practice adding 4-digit and 5-digit numbers with these printable worksheets. Recommended for 3rd and 4th grade students. Some of the activities below are aligned with the CCSS (Common Core Standards). Add the 4-digit addends to find the sums. Includes two word problems. Add four-digit numbers to complete this math crossword puzzle. These cards have addition problems with 4-digit addends. Use these cars in your math learning center, with your classroom document camera, or as cards for math games. At the top of this page are numbers written inside of polygons. Students add numbers in similar shapes. For example: Find the sum of the numbers in the octagons. Solve these four-digit addition word problems. Students add 4-digit numbers to and 4-digit numbers. The graph paper ensures that their columns are lined up correctly. Use the key to decode the addends in the secret symbol numbers. Then solve the 4-digit addition problems. Solve the 4-digit plus 4-digit addition problems. Glue the answer squares on the grid to make a dinosaur picture. First solve the 4-digit plus 4-digit problems. Then glue the picture puzzle pieces over the answers to make a picture of a rocket ship blasting through outer space. Look carefully at the completed addition problems. There are mistakes. Re-solve each problem to find the correct sum. Then explain the mistakes in the original solutions. Add the 4-digit addends to find the sums. These four-digit addition problems are written horizontally. Students rewrite them vertically to solve. Solve each 4-digit addition problem. Then cut out the cards and sort them into two different categories: Odd Sums and Even Sums. Choose numbers from each circle. Add them together to find the sums. Do this six times. Scan the QR codes with a iPad or smartphone to view word problems. Each problem requires students to find the sum 4-digit addends. Find the sum for the problem on each task card. Check your answers by scanning the QR code on each card. Includes 30 task cards with barcodes, a worksheet to show work, and an answer key. Rewrite the problems vertically and solve. Choose a 5-digit number from each circle. Then add to find the sum. This page has 10 practice problems and a word problem. All are written vertically. The top of the page has an airplane picture. At the bottom there's a travel-themed word problem. Each of the problems on this page have 4-digit numbers. Some problems have 3 addends, but most have 4. This activity has a picture of a satellite and a space-themed word problem. Here's a riddle for students to solve: What do you call a skeleton that won't work? 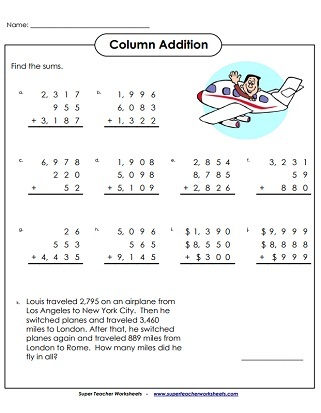 In order to solve the riddle, your students will need to solve these 4-digit column addition problems. Study the completed math problems and look for errors. Explain the mistakes and solve correctly. What did the duck eat for lunch? To find the answer to the riddle, solve the math problems. Then match the answers with the letters. This page contains tape diagrams (also known as bar models). Students will need to add or subtract to find the missing numbers. Complete seven tape diagrams (bar models). Then write an addition and subtraction number sentence for each. This version is a 2-page worksheet with work space on the right. What do you do if you meet a blue elephant? To find out the answer to this riddle, solve the 5-digit addition problems. This sheet has six bar models. Students add or subtract to find the missing numbers. This worksheet has mostly 5-digit numbers. This page has 5-digit addition-subtraction tape diagrams (aka bar models). There are seven problems on this file. 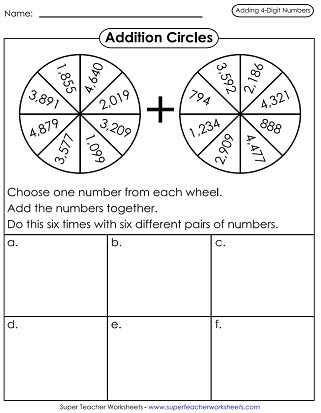 Try making your own addition worksheets. Select the number of digits you'd like, and the number of problems. Our generator tool will make a worksheet specially for you. If 4-digits is a bit too much for your students, try jumping down to the 3-digit addition PDFs. This page features basic 2-Digit addition with regrouping.